Traditional wood staining using Hemlock bark. For centuries the bark of the Hemlock tree, (Abies canadensis, Michaux. (Pinus canadensis, Linné;Picea canadensis, Link; Tsuga canadensis, Carrière). has been used to create a stain for coloring wooden dishes among the North east woodland and great lakes nations of indigenous people. 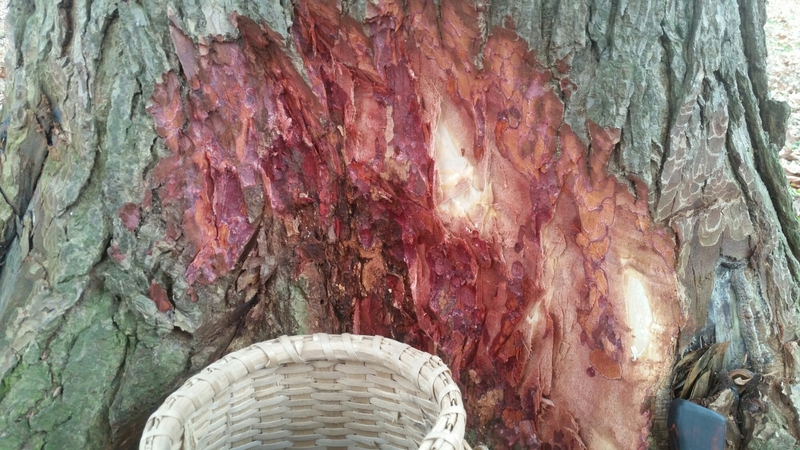 This stain rendered from the boiled bark, not only colors the wood but also adds a protective oil, known as oleoresin. Arthur C. Parker ‘ s book, “Parker on the Iroquois”, states that, the dishes were boiled in a solution of water and the bark of the Hemlock tree, producing a black color. 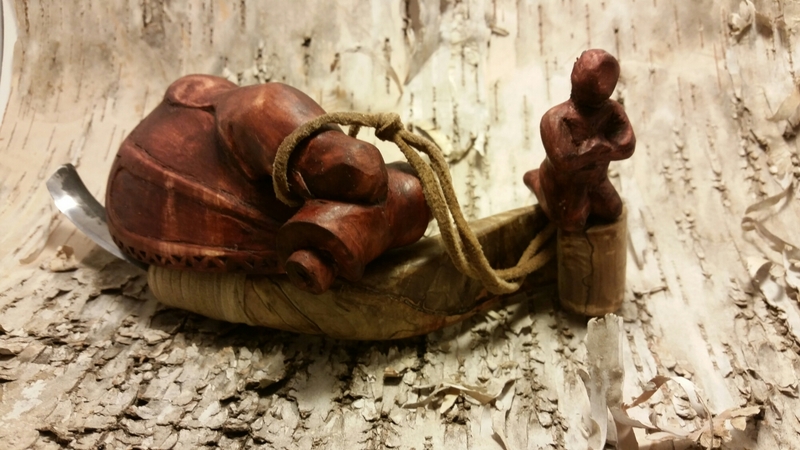 These dishes were prized on the darkness of the color and the oil the wood held. Harvesting times play an important role in quality of color and in quantity of resinoids. The best time I’ve found to harvest, yielding the best results are during winter and early spring when the oleoresins are condensed in greater quantities at the base of the tree. In my research on this natural stain, I’ve found it will produce three different colors depending on which part of the bark is used. The preperation of this stain is fairly straight forward; start with a pound or so of the bark, add water, and boil. Ive found the best reduction rate to be 10 gallons of water reduced to around 2 pints. The finished product should have the viscosity of milk. They’re are three ways of applying this stain, all require the stain to be boiling. After an hour of boiling the white wood took on a purple color, after 4 hours submerged it became pitch black. Second application, using only the outer bark or rough scales, I repeated the same reduction ratio. 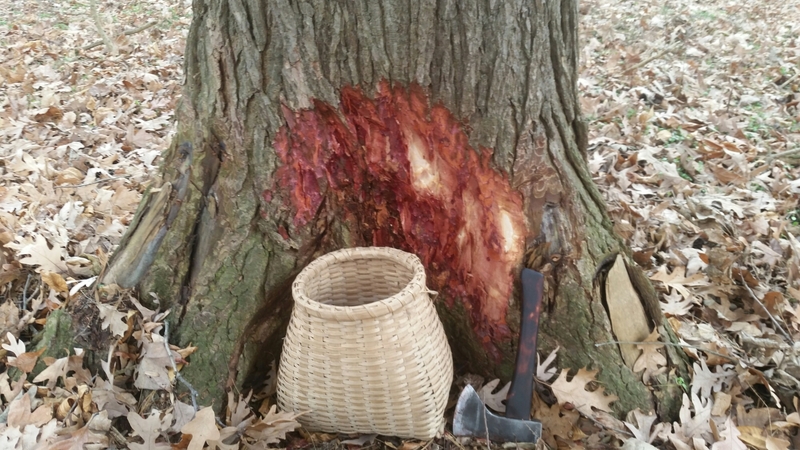 Using an Box Elder (Acer Negundo) burl cup, I poured the boiling liquid over the cup, and using a cotton rag I began rubbing the cup. 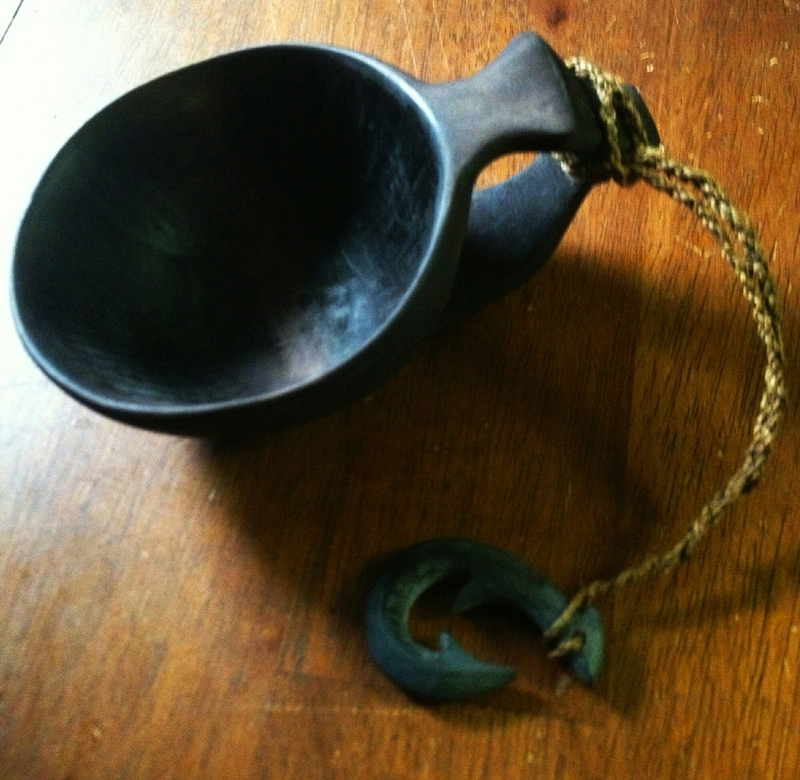 As the liquid evaporated and cup began to cool small black dots of the oleoresin started to appear, the rubbing with the rag pushed the oils back into the wood. This method took between 6 and 8 applications, with cooling and dry time inbetween, to achieve the desired color. The final result was a blackish brown. The only draw back was the rag absorbed alot of the color. The applications for Hemlock stain are not limited to just eating ware, I use it on my mokotagen handles and many other pieces of carved wood. Gunstock war club made of maple and colored with hemlock.. The finishing process is an easy one, once the Hemlock stain dries it will leave a dull powdery residue on the wood, this can be lightly sanded off or left on and let mix with your choice of oil. Personally I like to leave the residue on when I apply the mix of bear fat and bees wax, the oil rehydrates the dried residue and let’s it absorb into the wood further giving more bang for your buck. After each application of oil/wax I’ll burnish the piece with a smooth section of whitetail antler, until the surface is smooth and shiny. I’ll repeat this burnish and oiling at least three times. Love the look and the fact you are using traditional methods in you work.. We need to keep these methods and techniques alive.. Thanks for sharing my friend..
looks realy nice, is its possible to bye som of these layers of bark and oil ? Not at the present moment, it takes quite a bit of time to prepare. Wouldn’t it be less harmful to the tree to use branches and twigs when the moon is full and the sap is running? The cambium would be full of the oils, and the tree would not have to recover from the wound. Even removing twigs and branches would leave a wound, and the amount of material needed from small branches would cause a greater affect than the small section of base bark removed. With anything harvested great care and respect is taken not to do any damage to the tree that would harm it in the long run. What’s not pictured is the mud patch put on the harvested area to form a band-aid of sorts. Bark has been harvested from many types of trees for eons without causing irreparable damages, cedar weavers are able to harvest the same forests for generations because of responsible harvesting techniques. As long as no more than 1/3 of the circumference of the tree is harvested , the tree will heal over and repair itself. We take only what is needed and no more. Guess who is going to try an axe haft? This guy, Nick. 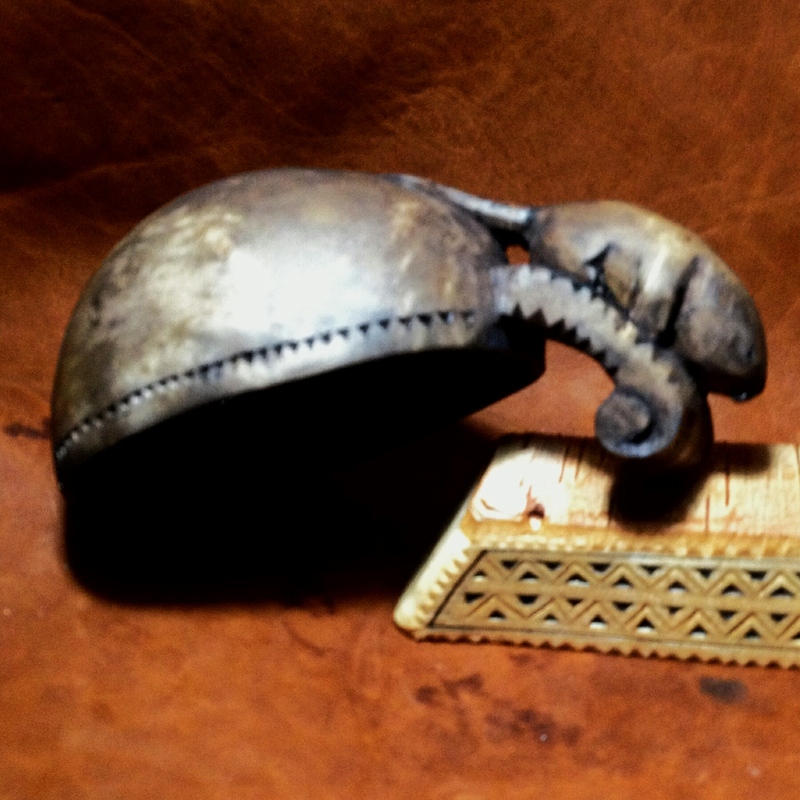 Beaver Tooth Mokotagen Blade, a Rambling.